Terrain: Footpaths, byways and fields. I parked in the lay by as suggested and as I drew up I realised that I had been here before on a earlier caching trip. It was a nice bright morning as I set off to number 1, not that far from the car. I walked around the back roads to the second cache, passing some horses on the way. The path leading to GZ wasn’t at all muddy, much to my surprise. I continued along the same track, still in good condition. A quick find again here. I spotted a muggle ahead with his dogs so made sure that I didn’t give the game away. A fantastic cache, definitely one of the biggest like this that I have seen. Onto a section alongside the main road, although noisy it was totally safe walking along the cycle path. I soon found the cache and was on my way again. I continued along the cycle path to number 5 on the outskirts of Weyhill. 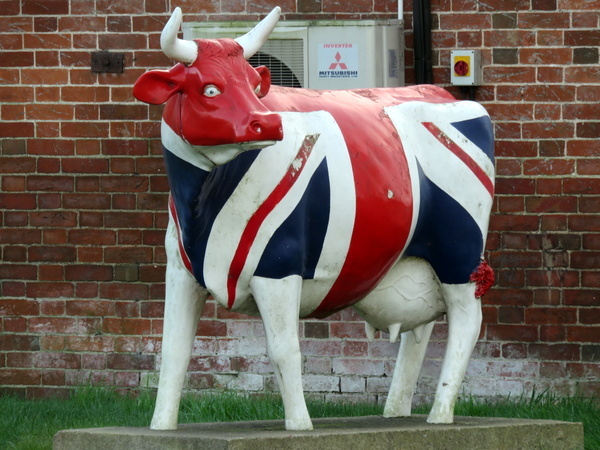 The cow painted in the colours of the union jack reminded me once again of my previous journeys along this road. I was out doing the Around Penton series and this was the next nearest geocache with a slight diversion, but it got me off the main road and bagged me an extra cache so there were no complaints from me. After a detour down Rectory Lane for an extra cache I arrived at number 6. It has gone a little bit overcast at this point after the bright start to the morning. It doesn’t look like many people would use this stile now. I crossed the field following the track, surprisingly it was a nice dry crossing to reach the woods. I timed it just right as a muggle passed me leaving entrance to the woods. I wandered through the woods along the path which was also in good condition. It took me a few minutes to spot the cache as the gps was taking me to another spot about 30 feet away. It was an easy walk to number 9 and a nice quick find at GZ. The sun looked like it may be coming out once again. I stood at the edge of the field looking across a very large ploughed up field deciding which was the best route to take. There were not signs so I chose to head in a straight direction towards the cache. I trod as lightly as I could to avoid clogging up my boots with mud. Despite the long crossing I arrived pretty much free of mud but just behind some muggle who were crossing the stile. I waited for the muggles to move away before setting off down the hill. The long grass knocked off some of the mud before I reached the village of Appleshaw. I located the cache quite quickly but moved away from the area to sign the log book. I continued along the road through the village to reach number 12. It took me a few moments to spot the cache which was nicely tucked out of sight. 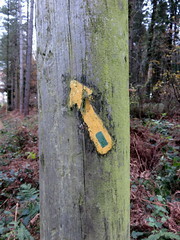 I walked through the village to the next cache and another one that was straight forward enough. The byway leading here was very dirty, wet and muddy so had to tread carefully along the side of the track to stay clean and dry, but a quick find at GZ. I continued along the byway a bit further to the next cache. Still on the byway but glad to be at the end of it now. I found it a bit tricky working out the route to this one as the OS map appeared a bit off true but I got here OK and soon located the cache. Getting into it was not so simple. It took a while before I had located the extra bit of information but then it took a bit longer to work out how to decode it. Eventually I was in after about 20 minutes! A great container but don’t think that it falls under a traditional cache as it felt more like a field puzzle. It was quite windy and cold higher up on the hill so I was glad to be dropping down a bit. I checked the answer twice as the result didn’t seem to be correct, but it was and the cache was soon spotted at the final co-ordinates. I somehow managed to bypass the footpath and the little small holding. However, I arrived right at the cache and soon had the logged signed. I walked up the little lane to GZ and then soon located this one. As I entered the field on the footpath my boot sunk deep into the mud! I retreated and found a way around it and then once past the entrance the track was much better. Walked around the edge of the field to the corner and then across another ploughed field. By the time I got across it, I had some very heavy boots. The walk to this one was quite short and not muddy this time. I walked around the edge of the field to reach this one. A nice quick find after a stroll down the lane and a clever way to hide the log. I walked down the track to the cache, the track wasn’t on the actual footpath. I could hear shot guns going off in the distance and in the field were several 4 x 4s parked up. I walked past the cars through the field, it was a little un-nerving with all the guns going off but as I got near to GZ a whistle blew and the shooting stopped. As I walked around the edge of the field to GZ, the long grass cleaned the mud off my boots. I had to wait for a tractor to go past before I could get this one. One of the game keepers were parked up right by GZ in his quad bike having a cup of coffee, there was no way of even getting close today. Last one and a quick find to finish off. Overall the series wasn’t as muddy as I was expecting it to be, given that it is winter. I had a very enjoyable walk around Penton today. The caches were all easy to find and the co-ordinates and clues were all spot on. Thanks for a great series.